A luxurious bathroom is the perfect place to unwind and prepare for the day. It is both functional and convenient, while comfortable and relaxing. At Steven D. Smith, we understand how important it is to create luxury bathrooms that fulfill every need. From exceptional craftsmanship to one-of-a-kind details, explore our very own favorite luxury bathroom designs. Featured in one of our Clyde Hill estates, this bathroom is a fan favorite. Tiles can transform an ordinary bathroom to become luxurious and sensational. Although we have implemented three variations of tiles by shape and size, they work cohesively with a similar color scheme. Best of all, this custom bathroom is spacious, allowing for numerous design elements to be implemented. For one, enjoy a built-in vanity and bathroom mirror to keep organized and ready for the day. Our bathroom designs are timeless and unique to each lifestyle. For this Kirkland waterfront home, we understand the Pacific Northwest features breathtaking views and take full advantage of that to create the perfect homes. 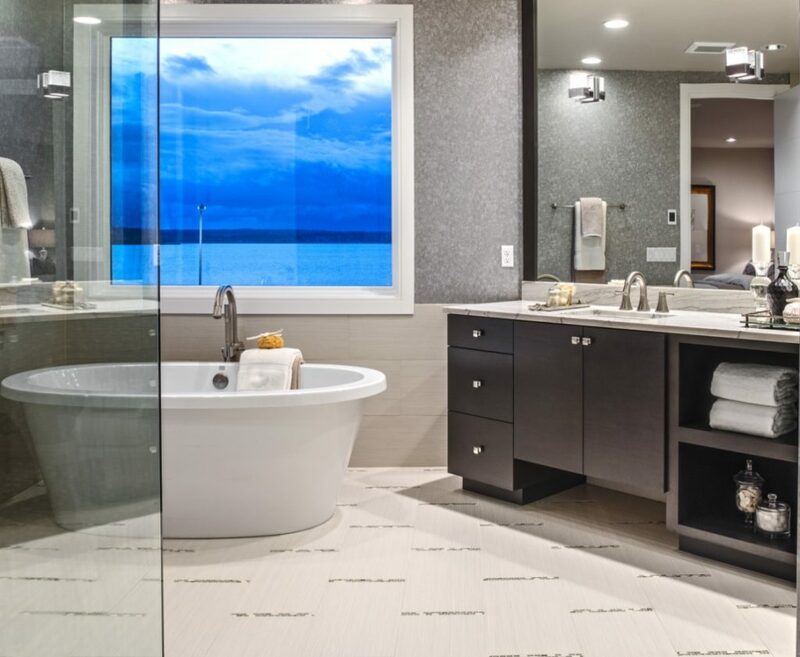 We upgraded this bathroom by implementing a window to display the incredible view of Lake Washington. 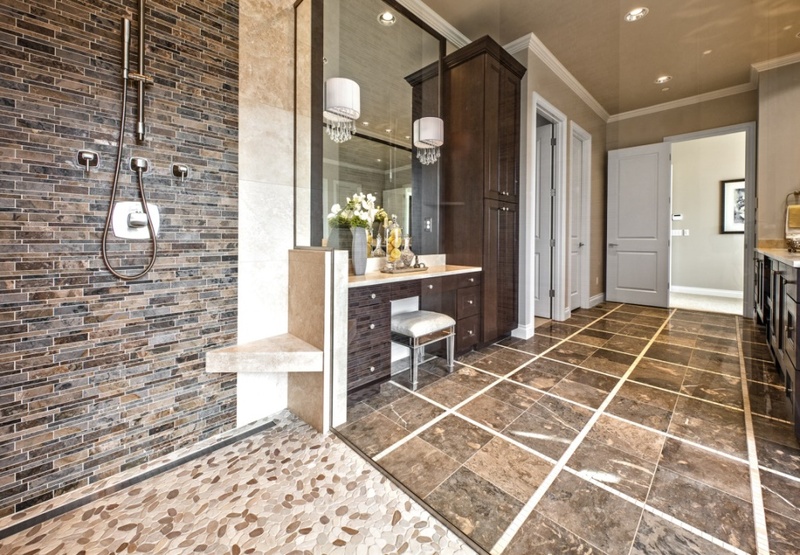 Master bathrooms are part of everyone’s dream home. This stunning neutral bathroom with a touch of silver features elements that easily accommodates. With matching his and hers sinks perpendicular to another, each partner gets their own expansive vanity area. Plus, we installed a dual head shower and a free-standing tub designed specifically for soaking. We can ensure our custom bathrooms are designed with the current trends in mind. New bathroom fixtures stand the test of time compared to outdated and worn appliances. 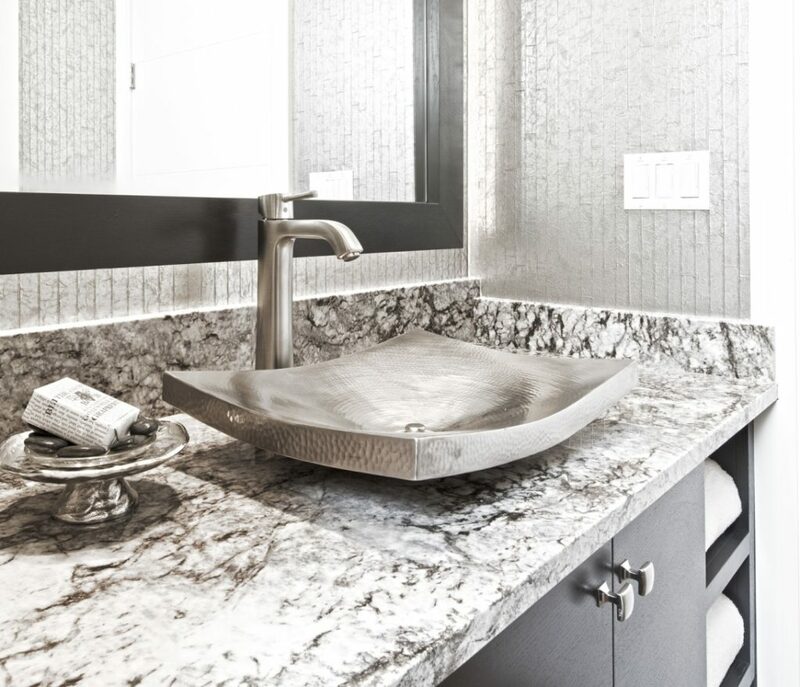 Currently, vessel sinks are a modern trend that our homeowners love. With its unique shape and style, this metal geometric shape creates a modern and expensive feel, transforming what would be an ordinary bathroom into a modern-day feast for the eyes. Steven D. Smith Custom Homes has offered incomparable design and old-world craftsmanship for over 35 years. We are the trusted builder of luxury custom homes in the Pacific Northwest because we never settle for less than the absolute best. Contact us online or (425) 869-2148 to start designing your dream home today.